Or: The invasion of Troop 113 from Groveland! I know this is redundant, but we had another great weather day for flying this past Saturday. The temps were in the 40's in the morning and 50's in the afternoon. There was strong wind at the start of the launch that was a little worrying, but soon died down to almost no wind and then picked up again at the end of the day. We had another small crowd; by my count, there were about 20 people in the morning including Troop 635 from Melrose, but more people came as the day went on. We had 200 flights from 1/4A through H and there was one successful Junior L1 certification. Pictures are in the Gallery. Please post yours! So getting back to the invasion - about 2:00, 30 to 50 scouts, scout leaders and parents from Troop 113 of Groveland marched from the parking area, across the field and set up camp. Each scout had a small cardboard Qubit, that they launched multiple times - there were Qubits raining from the heavens! Well, from 50 ft anyway! They also had some small rockets as well. It was the first time launching for most, if not all, of the scouts and parents and they needed a bit of help prep'ing their rockets and loading onto the launch pad. But with the help of Kenn, Guy, Howard, myself and a few others, it all went pretty well and the scouts and parents certainly had a good time. Congratulations to Howard for taking home the commemorative CMASS rocket! And thanks to all the volunteers, including Linda and Frank who helped with lunch! 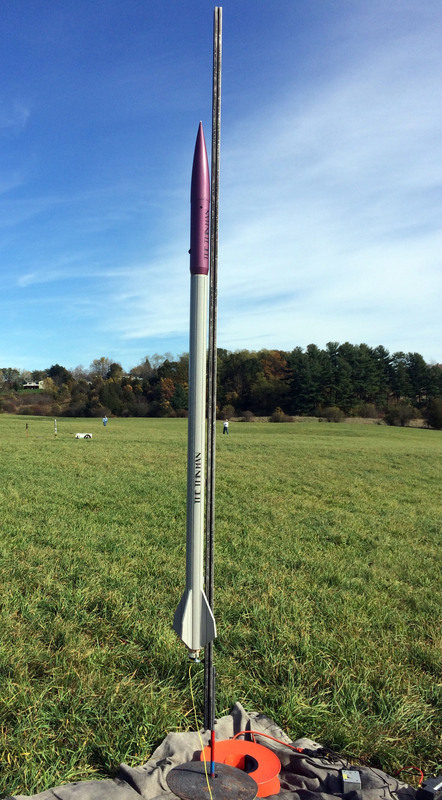 Our next and final launch of the season will be Nov 18 in Amesbury - which is our night launch!